Wow! 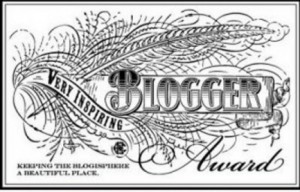 My good friend and fellow blogger, Rhianna, nominated me for the Very Inspirational Blogger Award. There’s something extra special about receiving an accolade from a peer. Thank you Rhianna! Link back to the blog of the person who nominated me. State 7 things about myself. 2. I have listed 12 of the blogs I am currently following that I consider inspirational. For me inspiration comes in many forms thus the variety you will find here. When I add another 3, I will post the information on my blog. NOT THE SINGER is Rhianna, a good friend and recent university graduate struggling like so many to determine ‘what’s next’. In her own words, she had been trying to fit herself into a life that isn’t her. She had lost the creative spark that charged her life. Then she recently found it again and shares the good and the bad parts of her journey of self-discovery with her readers. Rhianna`s blog is funny as well as insightful and highly recommended. J. Liz Saunders-McManus, my close friend, owns a virtual assistant business. With over 20 years of experience, Liz delivers exceptional office and sales support to a wide range of businesses located around the globe. More importantly, she does so with creativity. Visit her blog to read about the exciting ways she assists her clients to make their businesses more successful. Richard Radstone is a photographer, commercial director and film maker living in California. Over 300 days ago he initiated a year-long journey that committed him to interviewing and photographing a total stranger every day and then blogging immediately about his encounters. The personal stories and hopes for the future in his posts reveal a common thread in the fabric of our human experience. (Quoted from Jovina’s Blog) If you enjoy Italian food and want to learn the techniques for doing so, then follow this blog. The recipes are simple. everyday meals that you can prepare for your family. Italian cooking does not have to be expensive or fattening. Home cooks are usually frugal and use leftovers creatively in new dishes. [Jovina shares] . . . with you how to make such recipes healthy, while at the same time, creating delicious food. If you love photography then you MUST check out this blog. Every day, two brothers, Charlie and Tom, post one incredible photo by photographers from all around the world. The blog includes a description of the photo and an explanation of the technical aspects of the photo. For those non-techy types, simply enjoy the magnificent photography. If you are a writer, Kristen Lamb`s blog is a must visit. Kristen Lamb is the author of the best-selling books We Are Not Alone—The Writer’s Guide to Social Media andAre You There, Blog? It’s Me, Writer. A friend to all writers, Kristen`s blogs present honest, down-to-earth information about the writing business as well as humorous anecdotes about her life. In addition, she has created a new social network site for writers where we can connect with others in our field, get advice, support, etc. http://wanatribe.com/ Check it out! Chris Stocking shares the ups and downs with his writing career. He is currently enrolled in college majoring in journalism with a minor in English. He has written one science-fiction novel, a fantasy novella, and is currently working on a steam punk series. I enjoy his straight forward honest posts. Scott Mitchell wears his heart on his sleeve with his passionate, beautiful and sometimes painful poetic expressions of deep love for a special woman. Brenda Fraser`s shares her values and world view through her beautiful poetry. Joe Pineda is a fiction writer with a focus on crime, violence, loneliness, heartbreak and other noir elements. He is the author of the Spanish language novel MUTEKI (2011) and the eponymous short story collection The Bard of Steel(TPB), as well as three (as of yet) other novel drafts. Ever since 2008 he has endeavored to be prolific, an effort that continues with this blog. 3. Seven things about me. This isn’t easy. What about me is interesting enough to tell you…..??? 3.2 I love thunderstorms; the powerful cracks, roars and booms, as well as the dramatic fireworks displays that accompany them. During storms I sleep more deeply than at any other time and wake up totally refreshed. 3.3 Ah, I also love fireworks – the bigger and louder the better! Years ago I made it a habit to attend the international fireworks competition held on the waterfront in Toronto. To me, the only ones that compare are the 4th of July displays in Boston Harbour…. Simply magical! 3.4 There’s a skinny, active, fit person hiding inside me and she is ready to re-emerge and get back in shape. For a period of about four years she became a runner and felt healthier than ever in her life. Although she may not choose to run again, she is pushing me to lose weight, restore my core strength through Pilates training and find a fun aerobic activity to rebuild my stamina. I’ll let you know how that goes…. 3.5 I’m an animal lover and believe we have an obligation to protect animal life. Throughout my life I’ve had a pet dog and cats. At the moment my honey and I are petless. Our lives are simply too busy and we feel it wouldn’t be right to bring an animal into our home. But someday we will. 3.6 I love to watch things grow, change, transform. Whether it’s a seed that has germinated and begun to sprout a plant, a blank canvas from which a painting emerges, a story that evolves from a word or concept, a friend’s success in a business venture…. It’s a beautiful thing to experience something developing from what might have appeared to be nothing. 3.7 Friends and family at our home for a meal or a longer term stay is something I really enjoy. I find it stimulating to plan meals, organize the house to make guests comfortable, and get all the little details just right. It’s made me wonder if I should be running a Bed and Breakfast…..
Phew…. That’s it. Seven things about me. I will close off with another HUMONGOUS THANK YOU to Rhianna for my nomination and for being a strong supporter of all my creative pursuits! !